This last part of the school year has been a bit challenging for our little dude. We are getting some notes coming home in his daily binder; “rough day”, “agitated”, “did not want to work with classmates in group”, “impatient”, “not waiting his turn”, etc. It’s the end of the school year and Henry is having a hard time holding it together some days. This is not surprising to me for a kid with an autism diagnosis. We work daily in the area of his social/emotional challenges. Always. Still. Last week I had gotten a note and a call from the principal’s office that Henry was bothering some girls on the playground and he reached out and grabbed one of them by the shirt. This week a note came home, “arguing today”. Henry doesn’t like to get into trouble. And he really doesn’t like to talk about it when he does get into it. You can almost see how physically painful it is for him to admit he is wrong or to apologize for something. We have been working VERY hard on how to handle this in an acceptable manner. He wants to play with the other kids sometimes but he just doesn’t know how. Nor does he get those social cues when the kids don’t want to play with him or play his way. Another not-so-surprising aspect of his autism diagnosis. This is his most challenging area for sure! I was wondering if this most recent note had something to do with the playground issue from last week. I worry a great deal about what these social challenges might mean for Henry as he grows up. For how long will these challenges be oh-so-challenging for him? Will he ever learn how to navigate these waters appropriately? Will the kids ever understand and accept him for who he is? When I questioned Henry about who he was arguing with I got the typical first response I usually get from him, “I don’t want to talk about it!” He had just come home from school which is a rough time of day anyway. Fine. Let him decompress. Fair enough. Not that this is acceptable, mind you, but at least he was thinking about it and talking about it calmly with me. “I see her every day, Mom.” he told me in his “duh!” tone. “Yes, and I said I was sorry and I will try to be better.” (I don’t know if he actually did apologize to her but for now I am giving him the benefit of the doubt.) I figured this was the end of it at this point and we let it go. ummmm….wow! Now, I don’t know if there was any adult intervention or whether he did this on his own but still, big. huge. wow. “Oh, dude! That is really great! I am so proud of you! Great job!” But, again, as we continually try to practice and remind and practice more, I couldn’t help adding, “So now that you said you were sorry for that, you will try hard and not bother them anymore, right?” While he is getting better at saying he is sorry, he still has a hard time stopping some of the behaviors. I realize that Henry’s classmates will never really understand how hard all of this social interaction is for him. But today, I feel we are one more step closer to acceptance! From very early on I have always been searching for ways to connect with my son. A way we can do things together, being able to talk about whatever that may be or just having a chat while we are working together. Our first activity together was baking. It was the one thing we did together where Henry was engaged in the activity and with me. He loved measuring and listing the ingredients and numbering the steps needed to get to the finished baked good. Oh, and of course, sampling! 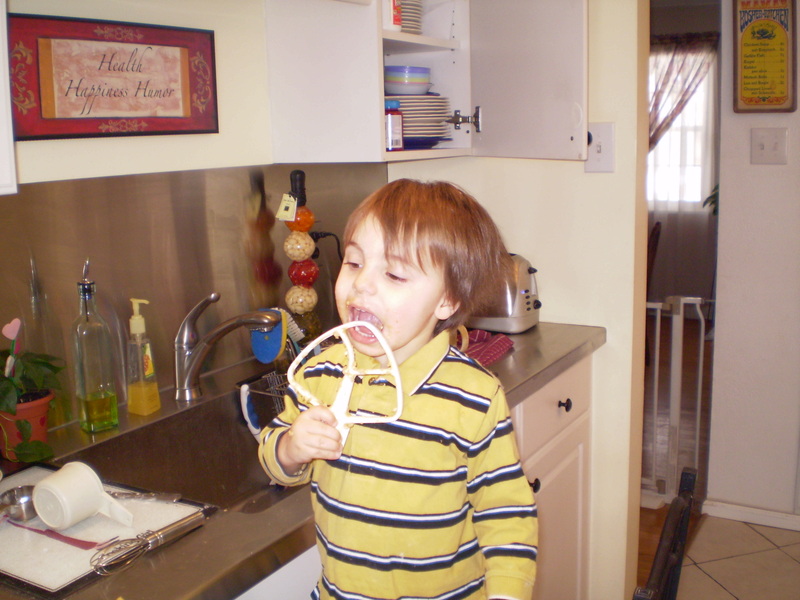 From about the time he was two until he was almost four, we baked like nobody’s business and had a freezer full of tasty breads, cookies, muffins, and pies at any given time! That activity eventually waned and he moved on to building and inventing things and with this Henry prefers generally to work alone, envisioning designs that only he alone can see. In a way, this move away from baking was probably a good thing for healthier living in the long-run. But since then I continually try to look for things that he and I can do where there is that real connection. A true mutual participation in a shared project. Did I mention we also love to sample? Recently I have acquired a new hyper-focus. Jewelry making. I have been having so much fun with it and the little ones love all the pretty colored beads and stones and charms. 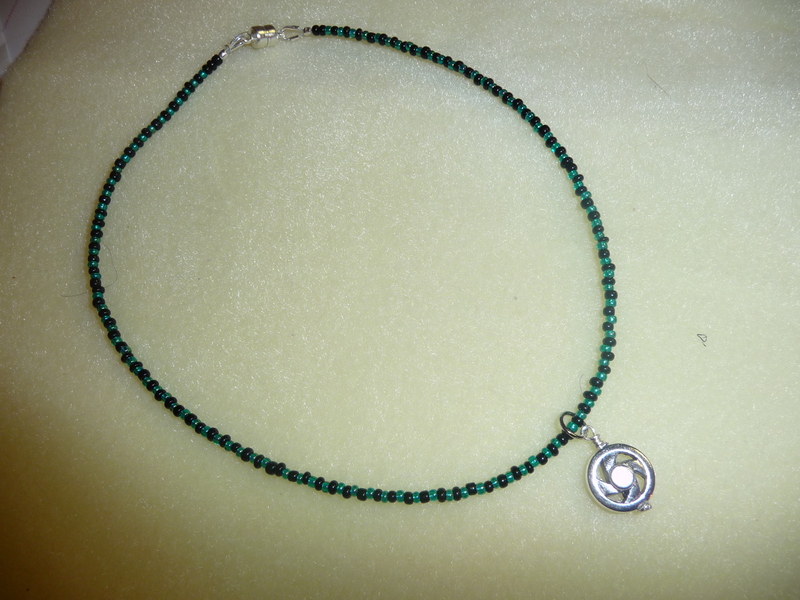 Of course, it is easy to make bracelets, anklets and necklaces for the girls. For Henry, it is a bit more challenging for me. For one, I am just not that skilled so I am limited in that way but also because well, “boy” jewelry is just hard. 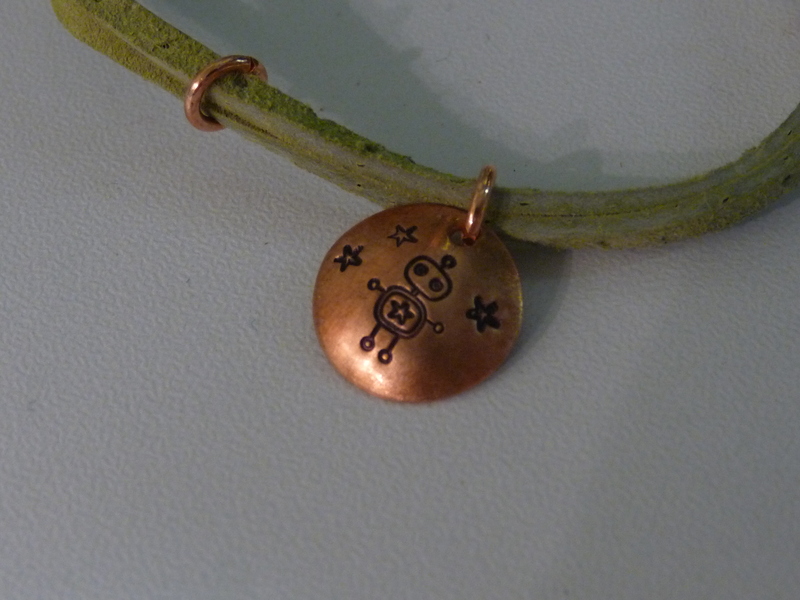 My friend at Crow Steals Fire made Henry this great bracelet made of green leather with a copper disk stamped with a robot for the charm. It is really cute and Henry loves it except that he says it tickles his wrist so he won’t wear it for long. He loves the beads and stones and sees the jewelry the girls are wearing and he has been asking for bead jewelry of his own. The pink and blue beads are his favorites but today I was able to influence him toward “real grown-up dude colors”. So away I went, swimming in a sea of seed beads. He was pretty patient for a long time (relatively speaking) and then he couldn’t take it any more. After a string of questions every few minutes, “Are you done yet?” “When will it be done?” “Now?” “How much longer?” Finally, he started asking if he could help. Oy! I imagined beads everywhere, parts and pieces on the floor, counter and chair. He began messing with my tools, digging in the beads. At this rate I told him it was going to take me even longer! I wasn’t even halfway done. Then he was the one that came up with a brilliant idea. “Well, can I help? I could hand you the beads you need.” Wow! Fine motor skills has never been one of Henry’s strong points and is pretty much NEVER a choice that he makes! He chose his tool he wanted to use as a tweezers and for half an hour he handed me seed beads, one at a time. (Talk about a fine motor skills work-out!) He didn’t want to string them himself but was just thrilled to be using a tool and helping! We talked about the colors of the beads and how tiny they were and how many there were. We counted them. We chatted about his favorite shows and even included Lucy in our conversations and we discussed her recently acquired jewelry. Connection! Love it!!! And not only did he practice fine motor skills and following directions he was able to revel in a sense of accomplishment! 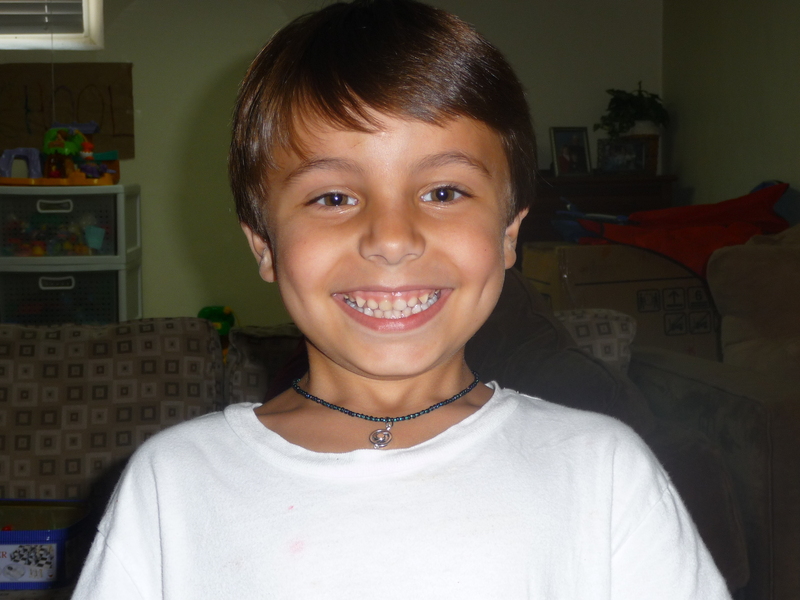 He was so proud of the necklace he helped to make! Since yesterday he has worn it quite a bit. I think because of the weight of it, it doesn’t feel “ticklely” to him and the fact that I put a magnetic clasp on it for him (he LOVES magnets) he can take it on and off by himself. I don’t know how long he may be interested in this new activity or if he’ll even want to do it again, for a short while yesterday, we really, really connected!